AccuWeather-(ENEWSPF)- AccuWeather reports after blasting the northern Caribbean, deadly Hurricane Irma will turn toward the United States, unleashing destructive winds, a catastrophic storm surge, flooding rain and inundating seas across Florida through the weekend. “Unfortunately, there is no way the United States is going to avoid another catastrophic weather event,” Dr. Joel N. Myers, founder, president and chairman of AccuWeather said. “There will be massive damage in Florida. 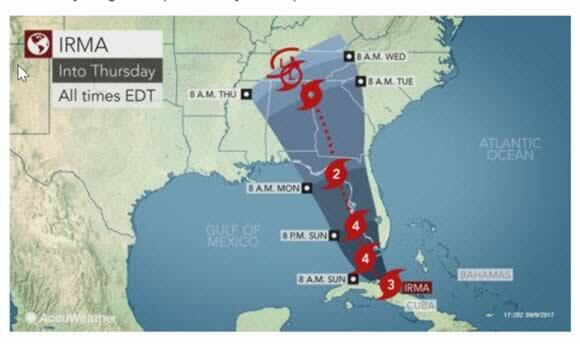 [It will be] the worst single hurricane to hit Florida since Hurricane Andrew in 1992,” Myers said. Preparations should already be completed across the Sunshine State. 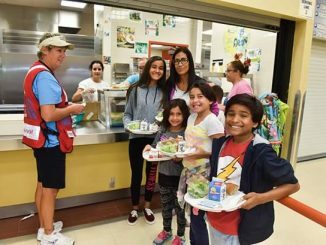 “Irma remains a very powerful and destructive hurricane,” AccuWeather Hurricane Expert Dan Kottlowski said. After the center of Irma tracked along the northern coast of Cuba Saturday morning, Irma became a Category 3 hurricane. AccuWeather meteorologists are still concerned that once Irma begins to turn north and head over the warm water of the Florida Straits, Irma will restrengthen. Regardless, Irma remains a powerful hurricane. Irma is projected to be at Category 4 strength when it makes landfall initially across the Keys and then southwest Florida on Sunday morning. Wind gusts past 140 mph in these areas could lead to a swath of catastrophic damage. “Impacts within the projected path of Irma include life-threatening wind, storm surge and flooding rainfall hazards,” Kottlowski said. The outer rain bands of Irma moved onshore in southeast Florida on Friday night into Saturday morning, bringing wind gusts between 45 and 55 mph. Conditions will continue to deteriorate rapidly across South Florida, including the Florida Keys, and will turn life-threatening into Sunday. Rain and hurricane-force winds will intensify quickly. As Irma turns to the north, torrential rainfall and high winds will then increase from south to north across the Peninsula on Sunday into Monday. 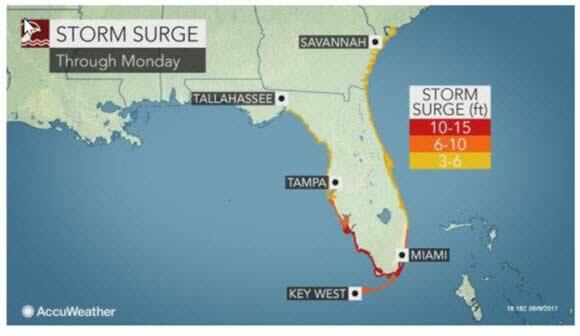 The largest storm surge will occur near and directly to the east of where the center of Irma tracks, which puts the Florida Keys and southwest Florida coast at greatest risk of inundation. However, coastal flooding will threaten both sides of the coast as a storm surge is expected to slam Tampa Bay, Miami and Melbourne. Some of the highest surge will affect Naples, Bonita Springs, Port Charlotte and Fort Myers. “It’s a monster hurricane out there — it’s bringing along with it something to be feared,” Myers said, referring to the “extremely angry ocean” that Irma has been churning for so long. Irma had sustained 185-mph winds for 37 hours, the longest any cyclone in the world has maintained such intensity. Super Typhoon Haiyan previously set the record in 2013 when it maintained winds at that level for 24 hours. “Rainfall across the Peninsula will average 10 to 15 inches with locally higher amounts which can lead to significant flooding issues,” AccuWeather Meteorologist Alyson Hoegg said. Poor drainage areas will be particularly susceptible to flooding from Irma’s torrential rainfall. Much of southwestern Florida will be buffeted by wind gusts of 100 to 150 mph which can easily knock down power lines and trees and cause significant to catastrophic damage to roofs and structures. Power could be out for weeks in some communities. 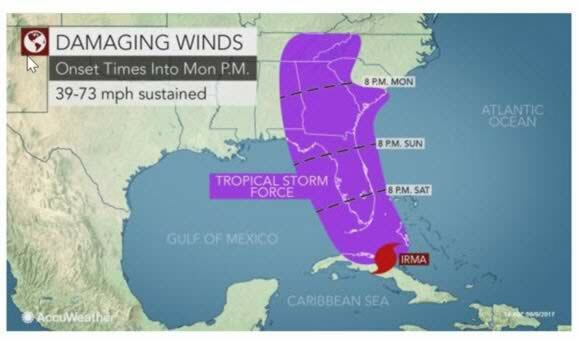 Downtown Miami will be spared from the highest winds; however, occasional wind gusts between 80 and 90 mph could bring down trees and power lines and cause destruction to mobile homes. Irma’s proximity to the warm Gulf of Mexico as it moves northward along the west coast of Florida may help it maintain hurricane intensity by the time it reaches northern Florida on Monday. Tallahassee and Jacksonville are likely to get battered by damaging winds and flooding rainfall during this time. “Irma could track far enough west of Florida that the center remains over the Gulf of Mexico and away from the coast,” AccuWeather Senior Meteorologist Tom Kines said. If Irma tracks farther west, then it will interact with warmer water for a longer period of time, which could lead to even further intensification. It also could increase impacts along the western coast of Florida and the severity of impacts across the Florida Panhandle. However, this scenario would also lead to less impacts along the eastern coast of Florida, from Jacksonville to Miami. 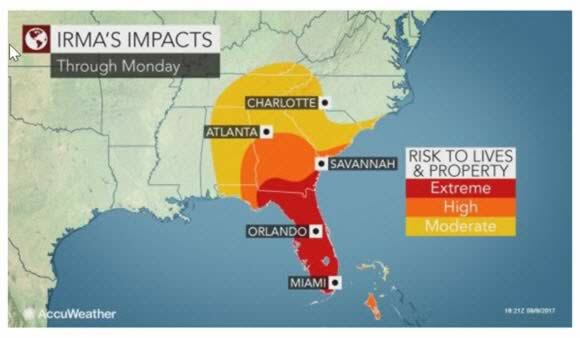 Isolated tornadoes will threaten areas on the northeast side of the storm, which will put much of Florida at risk for even further damage should a tornado strike. “Any land within 185 miles of the Irma’s center could see damage and any place within 50 to 60 miles of the center could experience catastrophic damage,” Kottlowski said. The citrus crop could be seriously damaged by the storm due to the long-duration of intense winds. Ripple-effect travel delays will be felt across the country, in not only domestic but also international travel, according to Myers. Preparations for the storm should not end in Florida as the Southeast will be next in line to face Irma’s wrath.